we celebrate the miracle of birth. card props go to SARAH. Go visit her...WOW!! 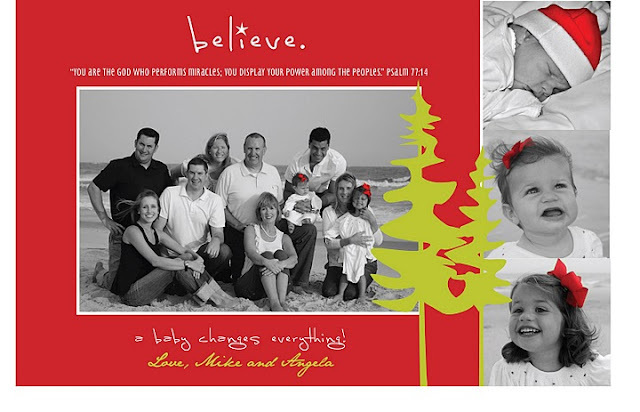 What a great Christmas card...and yes, a special birth, that changed the world! Love the babies, love the red bows, and love the message! I LOVE IT!!! What an awesome card! I love it! It's absolutely perfect. Wish we had ours ready to go. Hi sweet friend! I'm back and finally able to spend a little time on my computer. I don't know if I'll EVER catch up though. I've enjoyed reading through your posts I've missed. I LOVE LOVE LOVE your card! So sweet! Love the card and love the new banner with your new baby! Oh...I LOVE your Christmas card!!! Great...great...family photo! Beautiful card. Merry Christmas to you and your family!